Now, I really rate this series especially when you can get it on DVD and the episodes are uncut. It is a total waste of time watching them on TV because all the violence is taken out. Far more violent than 'The Professionals' although the two main leads don't have too much chemistry. Edward Woodward easily steals the acting honours and Lexa Doig looks truly stunning. I think Saracen (1989) was a better series, a mature continuation of the rules laid down by the original Pros, but its problem was that the first few episodes weren't action-packed enough although the final few episodes picked up. What I've seen of The New Pros isn't that great. Good thing Edward Woodward was in it. To really appreciate the series you need to see the uncut episodes which have never been aired in the UK. They are really quite violent for a TV series. I have only seen the Sky airings to date but thanks to the kind generosity of a fellow forum member here I recently acquired the uncut DVD versions. I am intrigued to watch these uncut for the first time I must say, even uncut I thought they were watchable. I am a massive Edward Woodward fan and it was a real treat that he showed up in this. Agree 100% about Lexa Doig! I seem to recall at the time this was first broadcast there was a ci5.co.uk that I think only sold Pros t-shirts? I bought one! I think this may have been a Sky/Wickes(?) marketing manoeuvre - the URL even pops up in the end credits. I am not sure who was behind the website but sure someone here might know. I know 45doyle is missing a few locations for this series but I do keep an eye out while street viewing. The uncut eps are top of my to list and I will report back here when I get around to watching them. IIRC the only country to air the uncut episodes was Sweden. I do have a production order here somewhere that 45doyle kindly told me but I have lost it! I know the UK episodes were shot first, then the South African ones and the US ones were done last. Now. I could never understand why 'High Speed' was my favourite of the whole series. I see the DVD Set from Australia is now available from Amazon for a mere £15.35 (+ £1.26 postage). The discs do say they are Region 4, they aren't, they are Region Free. Yes. I think if the UK were able to see the uncut versions on ITV then this series would have been a reasonable size hit show back in 1999. It might be a good show on its own merits, but The Professionals it ain't. I'm the first to admit that remakes, regardless of genre, aren't a patch on the originals. I will buy the DVD of The New Professionals but I will always, rightly or wrongly, compare it to the Bodie, Doyle and Cowley outings. I appreciate it is only my opinion and as such will always be subjective. Suppose it's like when your favorite pet snuffs it, a new one is just as sweet but, somehow, you just can't connect with it in the same way. 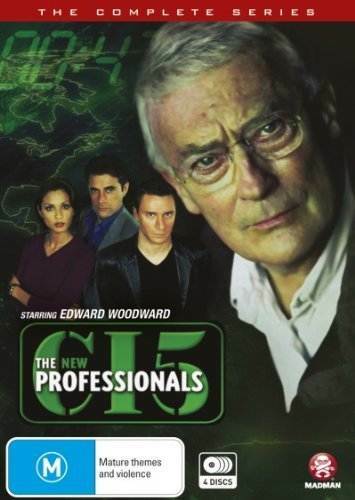 Interesting how the DVD cover makes it seem like the Edward Woodward show + those other guys. Unfortunately, just like with any remake (Minder, The Sweeney) there are bound to be comparisons drawn with the original and for me I just don't think the chemistry was there between Curtis & Keel that existed between the original characters in any of the shows mentioned on these forums. They do a good job but there just doesn't seem to be the spark that is in the shows mentioned here. I have to say in my opinion the music and the opening titles are just not there. Because I know the original Laurie Johnson themes so well, this one sounds a bit like it was knocked up on a 9.99 Bon Tempi from Argos. The vehicle smash is clearly a nod/pinch from the original and it is 'ok' so if comparisons were not meant to be drawn then this certainly points you in the right direction i.e. you've seen this cool stuff before. This was produced in a time when glossy 'fantasy' type shows were right up there e.g. Buffy The Vampire Slayer, Angel and there is part of me that thinks perhaps the producers wanted to be part of this same US bandwagon. I wonder if this was the reason the wacky storylines appeared that certainly are beyond the realms of reality in this. When I watched the, albeit edited versions of the show the only one thing that seemed to hold it all together was Edward Woodward and a host of good actors being it. I think Kal Weber does a good job too as Chris Keel but sorry Colin Wells is the flop of the bunch - Curtis feels like he is way out of his depth in CI5 to me and Wells seems a little unnatural in the hard man agent type role. They should have got an actor like New Zealand's Karl Urban (Dredd, Star Trek) to play Curtis. He is the archetypal hard man actor these days and he himself starred in an all-action buddy buddy crime show a few years ago called Almost Human. Yes, Colin Wells was a poor choice to play Curtis. What has he done since? He starred in the rubbish reboot of 'Crossroads' and he had a walk on part in 'Corrie' a few years ago. Bit parts in soaps! His career has certainly nosedived. At least Lexa Doig has kept herself busy in some high profile projects. I see Kal Weber is still acting. I didn't realise Kal was 10 years younger than Wells! He was in 'Hollyoaks' between 2003-05 but that was his only long-running main role since 'Crossroads'. Not one you would want to brag about! The last I saw of Colin was a while back and his hair was starting to migrate south. I wonder if he has joined the Syrup Club? Jason Statham could have been best suited to the Curtis role as he wasn't really famous in the late 1990s and of course, he played an ex-SAS man in The Expendables. Before The New Pros, there was a series on ITV called Bodyguards starring Louise Lombard which got some pretty good reviews at the time and it was even compared to the original Pros because of its quite political/espionage stories. It was shown in '96. ITV also had Thief Takers. Agree that Statham would have been a great choice for Curtis. Nick Moran could have had a Murphy-type role. The New Pros went into production before Lock, Stock & Two Smoking Barrels I think. I didn't enjoy this series at all, too clean cut for my liking. I might do what a post above states and watch the uncut versions as I only ever saw it on Sky when originally transmitted. Daz, PM me if you need the uncut versions. I think the show's problem was that it was a generic action show that could have easily been made by the Americans. It wouldn't have been out of place back in the late '80s or early '90s with those sorts of programmes. Back in 1998, there was talk of reviving The Sweeney with George Carter promoted to Commander, having three young cops (2 men, one woman) under his charge. Luckily, it didn't happen. With respect to all those involved, this is why I'm so reticent to take the plunge. Although I'm not caught in a antiquated votex, I do love the realism of the unshaven Bodie, Doyle... Can't be doing with a glossy 90s version of a programme that is IMO unmatched. There will always be those who gravitate to a remake... no sure it's me. I only saw trailers of it and Colin Wells wasn't convincing as a CI5 agent. I like Edward Woodward and would have given it a try had it not been for Colin Wells. I think the show's problem was that it was a generic action show that could have easily been made by the Americans. It wouldn't have been out of place back in the late '80s or early '90s with those sorts of programmes. I disagree, I think there was far too much violence for it to be a US show and the series has a distinct British feel to it despite the South African and USA locations.